Signagelive has partnered with AdMobilize, a global leader in computer vision intelligence, in order to bring real-time audience analytics and dynamic creative capabilities to digital signage networks across the globe. AdMobilize´s transformative analytics platform provides data to understand attention, demographics and emotions of viewers engaging with networks powered by Signagelive. Signagelive and AdMobilize have several case studies in the works in partnership with VARs, MSPs and Networks for the remainder of 2017. Both companies look to grow the number of projects throughout the year and continue to provide a more seamless solution that continues to evolve the convergence of data and digital signage. AdMobilize describes itself as a machine intelligence company making sense of the physical world. The company’s mission is to connect the physical world to the online grid by utilizing pioneering computer vision and artificial intelligence technology. 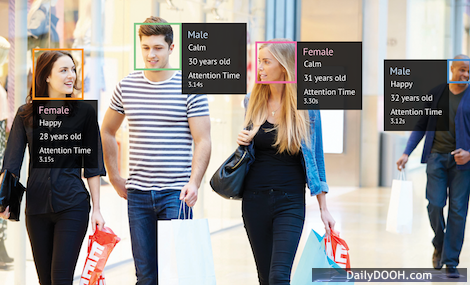 AdMobilize provides the DOOH, OOH, and retail industries, the most complete and turnkey solutions including: audience measurement and computer vision solutions including face detection, vehicle recognition and crowd analytics. AdMobilize’s team consists of 40 seasoned data science, computer vision, and hardware engineers who have created highly scalable solutions equating to the “Google Analytics” for the physical world. This entry was posted on Tuesday, July 4th, 2017 at 13:39 @610 and is filed under DailyDOOH Update. You can follow any responses to this entry through the RSS 2.0 feed. You can leave a response, or trackback from your own site.